Start in Plymouth Ohio and head south on Ohio Rt 603 ... end at Ohio 95 near Perrysville Ohio. Leaving from Plymouth Ohio, 603 just gets more scenic as you head south. By the time you reach a town called Mifflin it is nothing but hills and scenic views. Once you reach where 603 and Ohio 39 come together any choice you make will take you through some great scenery. The area is near Mohican State park and there are quite a few different routes that are great for riding. 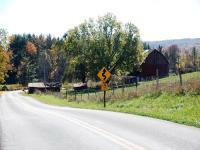 There are a lot of great routes to ride once you reach the Perrysville area. Take a map and enjoy all of them. Nice smooth roads with a lot of easy curves and hills. The biggest thing to worry about is making sure you're paying attention to the road and not getting too caught up in the stunning scenery. The roads are all pretty good. There are a lot of little country stores along the way as well as a couple of parks. Mohican State Park is easy to reach. Just follow the signs. Right off 603 where it intersects US 30.
on March 19, 2015 1 out of 1 members found this review useful. Beautiful stretch of road that takes you from the boring, flat plains of NW Ohio toward the hilly and picturesque scenery of SE Ohio. The road is in great condition as of August of 2014, so no worries. This is road meant for cruising and peace of mind. on June 30, 2009 1 out of 1 members found this review useful. This is indeed a good road to ride in either direction. It takes about an hour to go one way. Get an ice cream cone in Mifflin. The little place on the corner of 603 and 30A is soft serve. On the opposite side of the road a couple hundred yards west there is a store that has hand-dipped. You can also get a good meal at the Mifflin Inn across the road. Nice scenery, little traffic, curves and hills, and good roads. Some construction going on right now, but it's almost completed. Watch out for amish buggies. Favorite part for me is the stretch between RT39 and RT95. on March 18, 2011 0 out of 0 members found this review useful. I've been riding this route since I got my first bike. No matter what kind of ride you are on this continues to be one of the best. It takes you right by Malabar Farm, Mohican State Forrest, Charles Mill Lake, and Pleasant Hill Lake. Tons of camping available and plenty to see. You could easily turn this ride into a weekend long getaway. on August 22, 2010 0 out of 0 members found this review useful. Great ride, good pavement, little traffic, great scenery, hills & curves, just like we like it. on March 22, 2010 0 out of 0 members found this review useful. on March 6, 2010 0 out of 0 members found this review useful. If you have time you are close to the longest covered bridge in Ohio. It is at Brinkhaven off Oh. 62 out of Danville. I'm near Akron and have been there several times using 585 to Wooster to Oh 3south to226 to Shrive and pickup 514 to Danville then east on 62 to Brinkhaven as you cross the Mohican river look south and the covered bridge is right there. on August 3, 2009 0 out of 0 members found this review useful. My husband and I left southern Michigan on Saturday 8/2/09 and headed for Route 603 in Ohio. The weather was warm and sunny. Considering we did not have to travel far from home, the ride was really good. The road conditions were good, there were some tummy tickles, nice twists, turns and beautiful scenery. We would recommend this route and we will do it again. We continued on to route 715 out of Mt. Vernon also a nice ride, but the hills are more rolling, still beautiful scenery. on July 4, 2009 0 out of 0 members found this review useful. I ride this route often. My favorite in northern Ohio.